Way back when in my pre-teen years, beauty tips consisted of using isopropyl alcohol as a toner (not kidding, my best friend’s older sister swore by it) and washing with whatever astringent face wash we could find to prevent zits. We used salicylic acid as a spot treatment and hoped for the best. This was before the internet existed, so we depended on old wives’ tales and advice from older sisters for clear skin. I’m here to spare you the same fate. Because you have internet and you care enough about your skin to do some research. I have transitioned away from spending boat loads of money on potions, lotions, and serums for my skin, and I feel good about ditching the expensive chemicals. I now rotate among my favorite oils depending on what my skin needs, and the time of year. I’ve been oil cleansing on and off for a year now, and I have several oils I use–sometimes alone, sometimes I’ll combine ’em into a homemade formula–for cleansing, moisturizing, repair, and protection. You might be thinking, “why would I put oil on my skin? Wouldn’t that cause breakouts?” Actually, the more you strip your skin of oil by using harsh cleansers, the more it compensates by overproducing sebum, causing all your washing and product application to backfire. Dead skin, bacteria, and build-up then clog the pores, and the excess oil is unable to escape. Bam, a zit. The oil cleansing method can be excellent for rebalancing oily and combination skin, especially when you use anti-bacterial oils such as jojoba combined with tea tree. 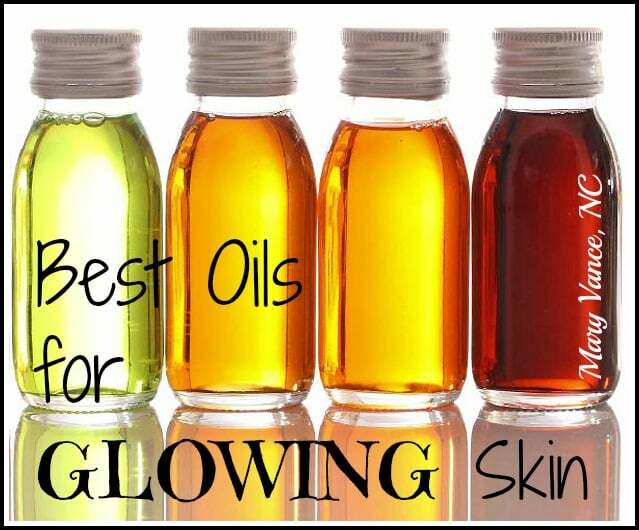 Oils are wonderful for all types of skin because they are rich in antioxidants (free radical protection = anti-aging! ), they don’t contain a laundry list of chemical ingredients, some have natural SPF, they plump skin (more anti-aging! ), they repair damaged skin, prevent wrinkles, and they’re well absorbed. Here are my favorite oils for your best and healthiest skin. 1) Rose hip oil (also known as rose hip seed oil) comes from the seeds of a specific variety of rose. It’s incredibly rich in essential (and non-essential) fatty acids that are easily absorbed by the skin and enhance tissue regeneration. Rose hip oil is high in vitamin C, one of the most important skin antioxidants, so it’s great to combat aging skin. I LOVE rose hip oil and use it daily. I mostly use it as part of or the base of my combination formulas (see below). It makes skin incredibly soft and dewy and erases fine lines, prevents wrinkles, reduces scars, and fades dark spots. I use this brand— it’s very affordable! If you have dry skin especially, this oil is for you for daily use. 2) Jojoba oil is my personal main choice for oil cleansing (my skin tends to be dry). Jojoba most closely resembles your skin’s natural sebum, so it’s a great skin conditioner and works well for combatting acne since it regulates skin’s own sebum production. It can be great for modulating oily skin. It’s rich in vitamins A and E and is a great anti-inflammatory agent for acne-prone or irritated skin. Also great for hair and scalp. 3) Coconut oil is of course the stuff of miracles and has been used for beautiful skin and hair for centuries (probably, I don’t really know how long). Coconut oil is naturally antibacterial and anti-fungal, making it another great oil for oil cleansing and regulating the skin’s microbiome. A saturated fat, it’s especially thick but absorbs quickly. BUT there is a big caveat: if you have acne-prone skin, coconut oil is probably not for you, as it’s highly comedogenic, meaning it may clog pores and cause zits. If you’re acne prone, use jojoba. I use coconut oil as a base for my miracle skin butter and use it most often in the drier winter months. It’s also a great wrinkle preventer and leaves skin looking very dewy. Also works great as a makeup remover. My dry skin loves coconut oil, but it’s not for everyone. 4) Carrot seed oil is pretty amazing for skin health. Like rose hip oil, it offers a high level of antioxidant support and promotes cell regeneration. Best for aging or damaged skin. I add a few drops to my everyday moisturizer. 5) Avocado oil is super rich in skin softening monounsaturated fatty acids and vitamin E. Good for soothing itchy, sunburned skin and eczema. It makes a great whole body conditioning oil because it’s not too expensive. Also good for oil cleansing for dry skin. Great for hair also. 6) Sweet almond oil is one of my favorite all-over body oils. Very rich in vitamin E and monounsaturated fats (notice a pattern here? ), it’s great for both skin and hair. It’s mild and another great one for overall softness and conditioning. Apparently almond oil is very hypoallergenic and a great choice for oil cleansing, but I’ve never tried it. I add a few drops of essential oil to it and apply for all over skin softness. Especially great for sun damaged skin. 7) Argan oil is another that’s rich in antioxidants and fatty acids. It’s a great moisturizer and anti-inflammatory. Improves skin elasticity, making it great for stretch marks. This is another great one to add to a carrier oil for all body moisturizing. I use this one. Also excellent for dry hair and scalp– just work a few drops in the ends of dry hair. 8) Pomegranate seed oil: pomegranates are as wonderful for your insides as they are for your skin. Super antioxidant-rich to promote healing and protect skin from aging, the seed oil protects, nourishes, and moisturizes. I use this with rosehip seed oil and tamanu in my everyday skin oil blend. I also occasionally use the Burt’s Bees pomegranate eye cream. 9) Tamanu oil is sticky and rich and one of the most effective agents in promoting the formation of new tissue. It accelerates wound healing and encourages the growth of healthy skin. It’s antibacterial and good for acne prone skin, eczema, and psoriasis. Great for acne scars. 10) Frankincense is probably my favorite essential oil. It is absolutely wonderful for skin. It protects and tones, encourages skin regeneration, prevents wrinkles, fades and heals scars, and makes skin soft and glowy. I add several drops to whatever carrier oil I’m using and sometimes apply it straight to problem areas. It smells rich, earthy, and divine, and I like to use it for meditation also. I use these essential oils. Myrrh is another I use in my DIY miracle skin cream. It’s excellent for anti-aging, good for chapped or cracked skin, and is a powerful antioxidant. Rose oil is super pricey (the real stuff, be aware that many rose oils only contain like 5% rose oil, or are not pure) but smells divine. It actually increases skin’s permeability, which means it enhances absorption and effectiveness of other oils you’re using. It’s anti-inflammatory, reduces redness, calms the skin, and moisturizes. Great for aging skin. Also has amazing aromatherapeutic benefits and is said to reduce depression. Neroli and palmarosa are great essential oils for skin also. Neroli smells divine, as it’s derived from orange blossoms. Note: I have fairly dry skin, so most of the combos I use are for dry skin and anti-aging, but I’ve included options for oily skin here. I use coconut, jojoba, rosehip, and sweet almond oil as carrier oils. My everyday moisturizing and anti-aging oil is a combo of jojoba, rosehip seed, tamanu, pomegranate seed, 2-3 drops carrot seed oil (it’s very strong) and often some type of essential oil like neroli or frankincense. For oil cleansing, I use jojoba as a base with a few drops frankincense. If you have oily skin, try this with tea tree oil. Coconut oil cleanser may work well for acne because it’s anti-bacterial, but it may worsen acne in some people. For my winter moisturizer, I make my DIY miracle skin cream with frankincense, myrrh, and carrot seed. I use rose hip oil as a base underneath the other oils all year round first thing in the AM and before bed. In the summer, I like jojoba as a carrier with a few drops rose hip, frankincense, avocado oil. I also love neroli. It’s good to prevent wrinkles and fine lines. I apply this before bed most often. As an all-over skin moisturizer, I use sweet almond oil with several drops of rose hip oil and frankincense. You can also use avocado oil. I’m in the process of looking for a natural alternative to commercial facial cleansers, so this is very helpful! Can you please give a little more information about your combinations? For instance, do you just add a few drops of frankincense to the whole bottle of jojoba bottle? Then do you just wash your face as you would with a regular cleanser and rinse it off, or is there a different method? There is a link to the oil cleansing method in the 3rd paragraph of the post. I use a small (maybe 8oz) bottle of the carrier oil with up to 10-15 drops of other various oils. This will depend on your skin and the season (I mention some of my favorite combos at the end of the post). When I shower in the morning I was my face with a cleanser and then apply a moisturizer before makeup – just wanting to see which would be best, going to make up a batch this weekend. Depends on your skin type and climate where you live. Coconut oil is too heavy for many people, esp in summer, and it can block pores. That said, if you live in a desert or dry climate or have dry non acne prone skin, it can be great. Coconut is solid at room temp, so it doesn’t easily mix with other oils unless you whip them all together. Wow!!!! !Nice blog with an amazing explanation. And it is very clear and useful too. Thank you for sharing your ideas with us. Hey, Is there one specific oil or other oils that are good for mature skin that is normal/dry for cleansing and moisturizing ? Coconut oil if you don’t have acne. Otherwise jojoba oil for cleaning. My every day oil combo I mention is perfect as a moisturizer, wrinkle- and age-fighter for normal/dry skin. You forgot beautiful bergamot oil that is so effective for these conditions because it has powerful antiseptic and relaxing, sedative qualities. These attributes make it a perfect tonic for the reactive skin. Thanks for sharing the useful post, Mary! Can I pin this post on my Pinterest board? My followers will love it. Your amazing insightful information entails much to me. I’m obsessed with essential oils, furthermore, I will try Jojoba oil first. Comment pls which of d oils can I combine to give me a flawless glowing skin dt will also remove stretch marks,remove surnbun ? pls I have a very sensitive and dry skin.pls something dt will not make me dark.